The Romans, noted devourers of land and oysters, probably knew what they were doing when they invaded England. They met little opposition and their first incursions into Britain and subsequent settlement strongholds, along the southern and eastern coasts, map well onto the sites of later 19th century oyster production. Quite what was in their mind when they tried to extend their territory to encompass Wales and Scotland is another matter entirely! Whether oysters were already present in the English southern and eastern coastal waters in significant numbers at the time (likely), or that the Romans quickly spotted the potential of this coastal area for oyster production (also likely), will probably always be a moot point. The Romans certainly knew about oyster cultivation long before arriving in Britain, indeed one producer, Caius Sergius Orata working around 95 BC, was so famed that it was reckoned that he could breed oysters on the roof of his house! Oysters are the most prehistoric looking of things. They actually look their age! It is possible, for example, that oysters arrived in the Chichester Harbour Conservancy area as early as its formation. The south facing aspect of the Harbour, combined with shallow tidal water and fresh water springs are ideal conditions under which oysters will thrive. Almost from the date of the first Roman landings, local records indicate an export trade of a variety of goods from the area of SW Sussex/SE Hampshire to elsewhere in England, and to northern France. In this trade Cogidubnus, a local lord of the area and apparent resident of the Roman Palace at Fishbourne, had some prominence. The subsequent emergence in the 19th century of the Emsworth oyster as being not only a notable component of the general exports from the area but pre-eminent in the national oyster trade is somewhat hidden under the dust of time and the fact that the existence of a settlement at Emsworth is not recorded until the beginning of the 13th Century. However, that the Emsworth oyster did become pre-eminent in the UK oyster trade is not in doubt. 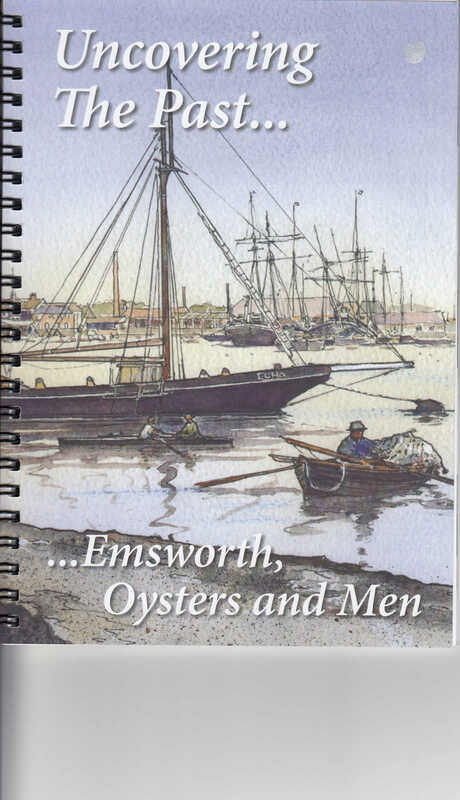 In 1760 a reported 24,000 oysters were dredged from Emsworth Harbour on one tide alone, and then sold in Portsmouth, while in 1788, it is recorded that over 7,000 bushels of native Emsworth oysters, with a value of £1,500, were raked and dredged by a dozen master fishermen. Later, as the fame of the Emsworth oyster spreads, fears were beginning to be expressed about its sustainability. The overfishing of the oyster grounds, as well as the practice of catching the brood of oysters and removing them to mature elsewhere in other harbours and rivers elsewhere (particularly along the eastern coast of England) was beginning to take effect on availability. So much so that The Emsworth Oyster Dredgers Co-operative was eventually established in the 1870s to improve and protect the industry. It did its job, and as a result the Emsworth oyster industry flourished, reaching its height during the last decade of the 19th century. In 1901, for example, between 300 and 400 people, out of a population of some 3,000, were working in the Emsworth oyster trade. It can be said, with some certainty, that the Romans knew a thing or two about feasts, and that a feast was not a feast without an oyster. Apposite therefore that the town's most important industry should be devastated by the happenings at a banquet. The great oyster scare of 1902 occurred when guests at a Winchester banquet became ill and the Dean of Winchester died from typhoid attributed to eating Emsworth oysters served at the event. Following inspection of the Emsworth oyster beds, gross sewage contamination was identified. If the Emsworth oyster did for the Dean of Winchester, then the subsequent publicity and findings of investigations of the case did for the Emsworth oyster industry. Sales plummeted, livelihoods were lost and the industry was devastated, never to recover its former esteemed position. Certain attempts to re-establish the industry in the town have been made, most notably between the two World Wars when the onset of World War II caused understandable interruption and disruption. The tale of the rise and fall of the Emsworth oyster industry, its boom and bust, is told in the Oyster Gallery, a permanent exhibition area in the Emsworth Museum. Set up as a fisherman’s hut (work place), the exhibition tells the full story of a millennium of this fascinating industry and its importance to the history of Emsworth through various media. 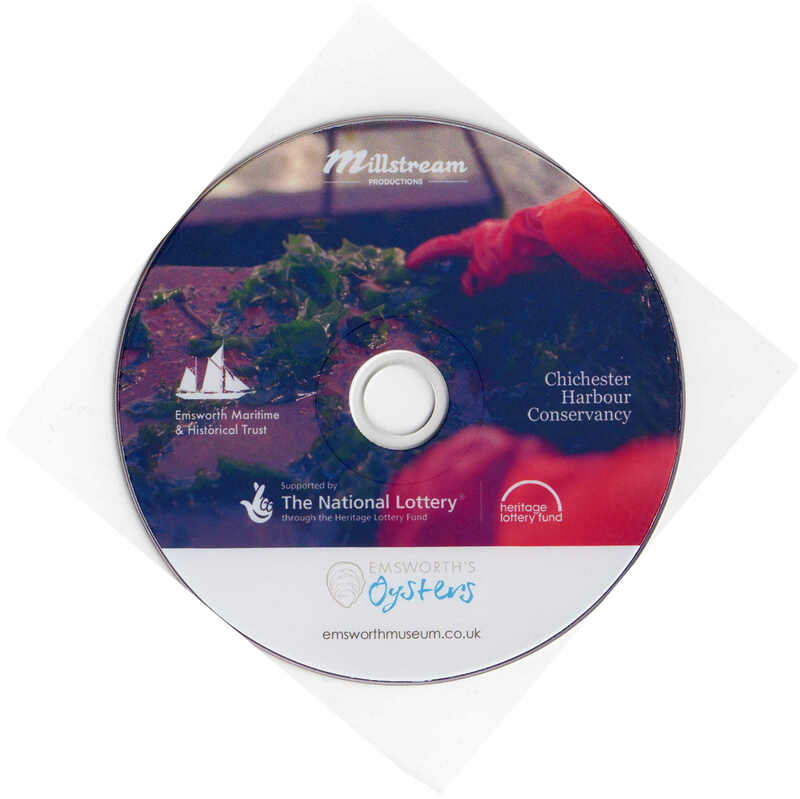 View the Heritage Lottery funded films of 2014, read the panels, look at the photographs and browse the files. You can’t get the t-shirt just yet, but you can buy the book! Top: Lovely oysters on a plate. 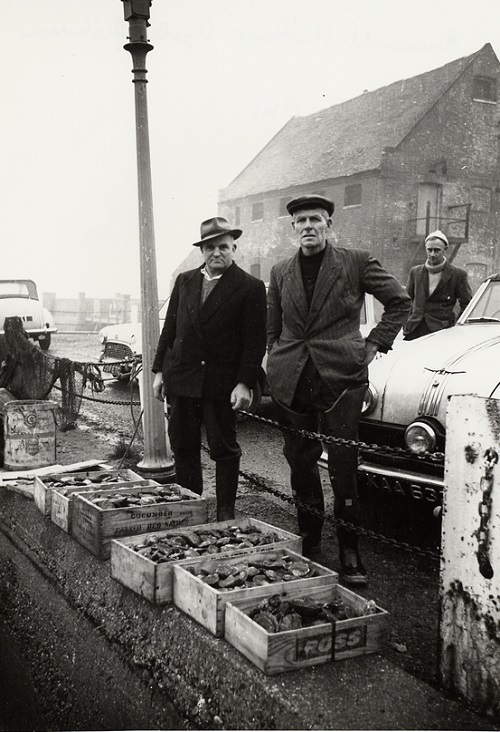 Middle:Oyster Fishermen on the quay in the 1950s. Bottom: A map from the Harmsworth Atlas of 1908 showing the fishing areas of the central south coast. Bottom: An ancient map of the central south coast showing the fishing areas.